Discover its features below, read testimonials from people who have built it, and place your order for plans, kit or a completed boat. Although seaworthiness and load carrying are paramount with this design, these attributes were included without sacrificing performance. Optimal performance is achieved through a long waterline length, plumb bow and stern (increasing waterline length), minimal wetted area (no keel, rudder or skeg), hull shaped for tracking, light weight, modest rocker (too much rocker saps speed by decreasing the waterline length and makes the boat vulnerable to broaching in large following seas) and minimal windage. Despite limited rocker and good tracking, the boat can be turned quickly. The immense power of oars combined with the stability of these boats allows full use of the steering force in single, reverse, or opposing strokes to bring the boat around quickly. Those used to sea kayaks, canoes and racing shells will be pleasantly surprised with the maneuverability that allows the Expedition to do a 360 degree turn as quickly as a whitewater kayak. This expedition-designed rowing scull is seaworthy, fast and can carry a month’s provisions. The watertight storage space is accessed through extra-large hatches and the roomy cockpit is adequate for rowers of all sizes. We designed this rowboat for an expedition rowing from Scotland to Syria that was the basis of the book Rowed Trip - From Scotland to Syria by Oar. These boats handled well in conditions ranging from stormy coastlines to placid canals. The hull is flat bottomed providing substantial initial and secondary stability. The defined angle between the keel panel and the first chine provides excellent lateral resistance and tracking negating the requirement of a drag-inducing keel or skeg that rounder-bottomed boats require. Click on the image below to view photos from our 4,200 km expedition from Scotland to Syria in the Expedition Rowboats. Seaworthiness is provided through five watertight chambers. Due to the hull’s shape and breadth, the boat is very difficult to capsize, but in the event that it does it can be righted quickly, and all water drains from the cockpit as it returns upright. No bailing required! The cockpit is easily re-entered from the side, and the rower can be underway again within seconds of a spill. 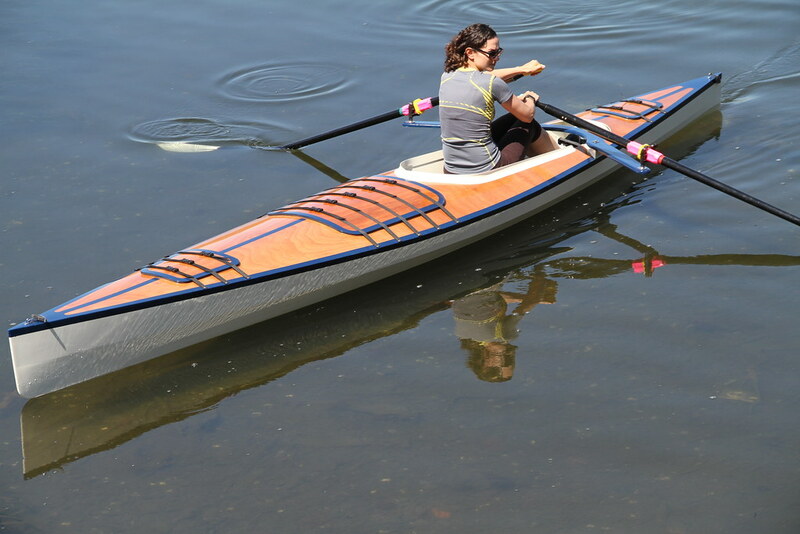 The greatest challenge in designing an open water rowing shell is in shaping it appropriately so waves don't flood the cockpit in rough conditions. It's one thing to be in a chop in a bay or lake, quite another to be in gale force winds off the treacherous northwest coast of Vancouver Island which are the kinds of conditions we designed these boats for. We've achieved this by elegantly increasing freeboard through the shaping of the side flotation chambers and the coaming. These boats have been truly tested, having been rowed thousands of km in adverse conditions. In February 2008, a British Olympic Gold Medalist Rower tried breaking the rowing speed record for crossing the English Channel. He used a high-performance custom designed rowing scull and had a time of 6:01. 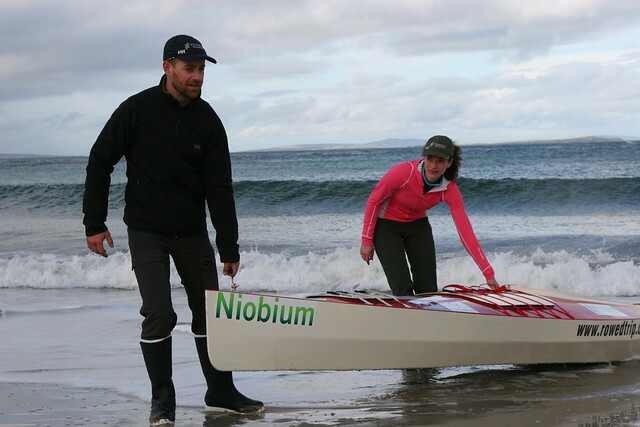 Two months later Julie and Colin crossed the same channel rowing 43 km in two Expeditions, each laden with a bicycle, trailer and other gear. They simultaneously reached the shores of France with a time of 4:56. How could Colin and Julie be faster than a gold medalist? Here’s Julie’s response - The weather was rough, but the stability of the boats allowed us to put our full energy into propulsion instead of balance. The 700 mile storm ravaged circumference of Vancouver Island has been a proving ground for some of the toughest paddlers, and an informal contest exists where a handful of the fastest endurance kayakers try one-upping each other vying for the speed record. No one had ever attempted this challenge in a sliding seat rowing boat because conditions were thought to be too rough for anything but a kayak. We believed the Expedition was up for the job and in 2010 Colin smashed the record by a full day (completing it in 15.5 days). Whether you're going for a weekend camping trip in style or an expedition through the Northwest Passage, this boat hauls gear like no other scull or kayak. The Expedition performs well with 400 lbs of gear and is capable of hauling double that at slower speeds. The midship hatch is large enough to accommodate a mid-sized mountain bike and break-apart trailer. Even if you don't have aspirations of lugging a bike or embarking on an expedition, there's nothing better than arriving at the camping site ahead of all your kayaking friends, and being the only one with a full sized cooler, crab trap, double burner propane cooker, deck chairs and a proper air mattress for a good night's sleep. Now that's camping! There's no other decked paddle/row craft in existence that can carry as much as the Expedition. A passenger can comfortably be accommodated in the spacious middle compartment. If you really want decadence, simply place a backboard against the hatch rim and lay an inflatable sleeping mat inside. Your passenger can straighten his/her legs, lean back and enjoy an uninterrupted panorama with the comfort of an easy chair complete with arm rests. In rough conditions, of course, the hatch should be closed. This boat is suitable for amphibious human-powered travel. It is light enough to be towed behind a bicycle and has room to carry the bicycle and trailer. Quality break-apart bicycle trailer systems can be purchased at Tony’s Trailers. Pictures from our 4500 mile expedition rowing from Scotland to Syria can be viewed here. This boat uitilizes stich and glue construction and is comprised of marine plywood, epoxy and fiberglass. Step by step instructions combined with photographs and diagrams make it a project suitable for beginners to experts. We also sell sliding-seat/rigger kits suitable for rowing the Expedition. View an Expedition Rowboat build gallery. To purchase the Expedition Rowboat plans or kit please click on the red link below. Includes seven-page plans booklet, 19' x 3' hull panels sheet, and manual. DXF files available for an extra $30. Includes CNC cut plywood components, hardware, epoxy, fiberglass, study plans, manual and more. Professionally built and finished with paint and varnish. Please contact us for details. Find out what other people have to say about their experience building the Expedition Rowboat. I had the first run in the Expedition Rowboat today - so much fun! The build was very enjoyable and I am super happy with the outcome. The kids are looking forward to hop on board next time. Managed a great Bowron Lakes trip couple weeks ago during that beauty high pressure system. Had the expedition loaded with gear and spare body in the main hatch. Nothing like drinking beer while your wife rows you to the next campsite...haha. I entered the open water race in Port Townsend just to see how it would perform next to race boats. It turned out I was the only entry in the under 19 feet sliding seat class, so not much to compare. I was pleased, however, to see that on a 8 mile course I was only about 10 minutes slower than a Maas 24 rowed by a friend of about the same abilities. In short I am pleased with the boat and the results of building my first stitch and glue boat. Thanks for an excellent design. I trained with this boat last spring and embarked on a 9 day trip. The boat itself was flawless and solid...the latter being what truly sets it apart from the traditional kayak. Albeit heavier, that weight affords you more cargo carrying ability and most importantly stability in the water which is paramount. Description of the boats written by Pat, from Pat and Caroline's journey from Bellingham to Haines, Alaska. The new boats seem to perform very well in a range of conditions. So far on this trip we've been in bigger water than ever with our kayaks and fared well. This is partially due to having oars that can brace well, but more to the size and beam of the boat. They are tanks. It feels more like being in a canoe than in a kayak. This is great for breaks and pee-stops on the water. It is hard to say how much faster than kayaks the rowboats are, but I might guess 1/3 faster. We tend to average 3+ miles/hr, but this can be as low as 2 in rough water or with headwinds, and as much as 4-5 with favorable winds. In a 10 hour day on the water without adverse conditions, we can cover 30 miles including short breaks in the boats. I took the expedition rowboat up the cape fear river in north carolina. I was gone four days and slept in the boat every night. The boat performed great. Thanks for all your efforts in designing such a sweet boat. I only slightly altered mine from the original plans. I did not install forward or aft hatches. I felt ample space is available by the large hatch alone for my purposes. And I did not make the cockpit (water diverter?) I forgot what its called. I have not had any issues with water entering cockpit from the front of boat even on choppy, windy days. I look forward to rowing many miles in the expedition! This was my first scratch build and I was really impressed with how well it all went together and trued up. Really enjoyed the build. I've had a great time building and now rowing the new boat. Now I'll leave the Hudson racing shell in the boathouse when it's rough.